What is Mother Teresa Catholic Church Legacy? 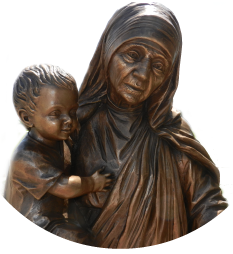 To join Mother Teresa Catholic Church Legacy, you must notify the church office that you have designated Mother Teresa Catholic Church as the beneficiary of a planned gift. Notification is nonbinding and revocable. A planned gift is any contract, will, trust or beneficiary designation that would result in Mother Teresa Catholic Church receiving a monetary or tangible benefit from a person's estate. Ways to Make a Bequest and a Difference. A bequest can take many forms. You may have designated the parish as a beneficiary in your will, trust or as the beneficiary of an asset such as an IRA, annuity or life insurance. You may also designate your parish as the recipient of a bank checking or savings account with a "transfer-on-death" or "pay-on-death" designation. Specific Bequest - This is a gift of a specific item to a specific beneficiary. For example, "I give my house to Mother Teresa Catholic Church." If that specific property has been disposed of before death, the bequest fails and no claim can be made to any other property. General Bequest - This is usually a gift of a stated sum of money. It will not fail, even if there is not sufficient cash to meet the bequest - even if other assets need to be sold. For example, "I give $50,000 to Mother Teresa Catholic Church." Percentage Bequest - This is a convenient way of making sure your heirs and those charities you support receive equal shares, and no one is left out. "I give devise and bequeath my estate to my three children and Mother Teresa Catholic Church in equal shares." Endowed Bequest - This bequest allows you to restrict the principal of your gift, requiring the funds to be held permanently and used only the income generated or a fixed percentage. "I give $20,000 to the Mother Teresa Catholic Church Endowment Fund." Beneficiary Designation - One of the simplest and cheapest ways to add charity to your estate plan is to change a beneficiary designation on retirement assets, IRAs or Life Insurance. There is no charge to make these changes. Any asset with a beneficiary designation can have a full, partial, or contingent beneficiary. Consult your plan administrator or insurance company for a beneficiary change form. Simply insert Mother Teresa Catholic Church into the form.